The American Veterinary Medical Association has approved a method of using Carbon Dioxide (CO2) to euthanise small animals weighing less than 2 lbs. Carbon dioxide can be used as an analgesic pain reliever at 7.5% and can be used as an anesthetic which causes rapid loss of consciousness with no struggling or distress at 30%-40%. Drowning, freezing or poisoning a chicken is NOT a humane way for them to die as they will suffer a horrible death. ​At high concentrations 80% or higher CO2 results in almost instant death but can cause painful eye irritation and respiratory tract irritation if high levels are used right away. It is important to use the analgesic concentration (7.5%) prior to high concentrations to reduce suffering. The AVMA states the flow of CO2 can be regulated adequately only by using compressed CO2, only the use of CO2 cylinders is approved. This method, being adapted for home use, does not require the use of compressed gas cylinders. 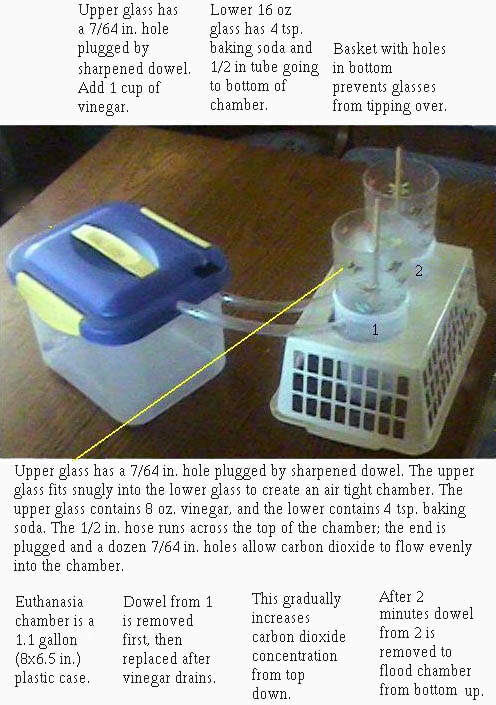 The AVMA Panel on Euthanasia has not been asked to approve the home made CO2 chamber method featured in the photo, and no approval is implied. "The AVMA approves the use of CO2 for euthanasia in most small animals including amphibians, birds, reptiles, rodents, and other small mammals weighing less than two pounds (1 kg). Some amphibians and reptiles, however, may breathe too slowly or be able to hold their breath for long periods of time making other methods of euthanasia preferable. Also some burrowing and diving animals (such as some species of rabbit and marine mammals) have prolonged survival times when exposed to CO2. Also excluded from AVMA approval would be all cats and dogs, even small ones. The following method has been tested only on rodents and is not recommended for use on animals or birds weighing more than 2 lbs". If you decide to use this home method do so at your own risk and discretion. Be sure to practice putting the bird in the chamber and all steps several times before you attempt to perform this procedure. ​Read more, see photos and detailed instructions. ​ Scroll down to see things you need to consider before euthanizing your bird or other small animal.Things you may need to do if you have used CO2 as an analgesic to put your bird to sleep so you could perform a surgical procedure plus best buys. 1. Is your bird's condition so severe that it causes the bird constant pain? 2. CO2 has the ability of being used as an analgesic pain reliever at low levels, causes loss of conciousness at medium levels and causes death at high levels. ​5. Once you use high levels of CO2 on the bird the effects are irreversible. There is no going back from there so be sure this is something you want to do. 6. Do not euthanize a bird with CO2 that you plan to eat. 7. Euthanizing a pet can be hard on you and anyone observing it can suffer emotionally with long lasting effects. 8. Be sure to keep CO2 in marked containers and store according to package directions. Do not use this on humans-ever. 9. Use only if there is no other alternative and be sure to consider your birds species, age, and health status. 10. Check,double check and triple check to make sure all equipment is in working order. 11. Prepare in advance as to how you will dispose of the body. Burying your bird in the ground may give you some peace of mind but it can backfire by drawing predators to your property. If an animal (like your dog or cat) digs the body up and consumes it there could be detrimental effects such as death. Predators digging up your birds remains really takes away from the peace you get from a little funeral. It is much safer and better to burn the birds remains in a funeral pyre (usually in a burn barrel) and then bury the ashes for the funeral. If carbon dioxide concentration is too high birds may react by seizing, flapping their wings, and other frantic movements as their body tissues are being damaged. It is recommended to start with a lower concentration and once the bird is unconscious raise the level to euthanize. The use of Carbon Monoxide (CO) causes more involuntary movement than Carbon Dioxide (CO2) does. "Carbon dioxide may invoke involuntary (unconscious) motor activity in birds, such as flapping of the wings or other terminal movements, which can damage tissues and be disconcerting for observers.248,270 Slower induction of euthanasia in hypercapnic atmospheres reduces the severity of convulsions after loss of consciousness.204,205 Death normally occurs within minutes, depending on the species and the concentration of CO2 present in the closed chamber" (AMVA). ​1. "Inhaled anesthetics are particularly useful for euthanasia of smaller animals (< 7 kg [15.4 lb]) or for animals in which venipuncture may be difficult. 2. Inhaled anesthetics can be administered by several different methods depending on the circumstances and equipment available (eg, face mask, open drop where the animal is not permitted to directly contact the anesthetic liquid, precision vaporizer, rigid or nonrigid containers). 3. Halothane, enflurane, isoflurane, sevoflurane, desflurane, methoxyflurane, and N2 O are nonflammable and nonexplosive under usual clinical conditions. Physical disruption of brain activity. ​1. "Inhaled anesthetics are aversive to rabbits and laboratory rodents and the same may be true for other species. Animals may struggle and become anxious during induction of anesthesia, with some animals exhibiting escape behaviors prior to onset of unconsciousness. Should apnea or excitement occur, time to loss of consciousness may be prolonged. 2. Ether is irritating, flammable, and explosive. Explosions have occurred when animals, euthanized with ether, were placed in an ordinary (not explosion-proof) refrigerator or freezer and when bagged animals were placed in an incinerator. 3. Induction with methoxyflurane is unacceptably slow in some species. 4. Because of design limits on vapor output, precision anesthetic vaporizers may be associated with a longer wash-in time constant and, thus, longer induction time; time to death may be prolonged as O2 is commonly used as the vapor carrier gas. 5. Nitrous oxide used alone will create a hypoxic atmosphere prior to loss of consciousness and will support combustion. 6. Personnel and animals may be injured by exposure to these agents. There is recognized potential for human abuse of inhaled anesthetics. 7.Because large amounts of inhaled anesthetics are absorbed and substantial amounts remain in the body for days,use of inhaled anesthetics for euthanasia is challenging for food-producing animals due to potential for tissue residues"(AMVA). ​"Carbon dioxide has successfully been applied for euthanasia of nonhatched eggs (pips), newly hatched poultry in hatcheries, and adult birds (including routine euthanasia of large commercial laying hen flocks 356,522) and on farms keeping birds for research or elite genetics. Because neonatal birds may be more accustomed to high concentrations of CO2 (incubation environments typically include more CO2 ), concentrations necessary to achieve rapid euthanasia of pipped eggs or newly hatched chicks may be substantially greater (as high as 80% to 90%) than for adults of the same species". If you are using the CO2 as an analgesic so you can perform a surgical procedure like caponizing, removing tumors, or amputating a splayed leg, you may need to administer oxygen when reviving your bird. The easiest way to do this is to use an oxygen tent or oxygen chamber for pets. 1. Personnel using CO must be instructed thoroughly in its use and must understand its hazards and limitations. ​2. The CO chamber must be of the highest-quality construction and should allow for separation of individual animals. If animals need to be combined, they should be of the same species, and, if needed, restrained or separated so that they will not hurt themselves or others. Chambers should not be overloaded and need to be kept clean to minimize odors that might distress animals that are subsequently euthanized. After euthanizing your bird you will need to confirm that the bird is actually dead. The bird may appear dead but may simply be unconscious. A lack of heartbeat, pulse, and breathing may indicate that the bird is dead but it is not 100% accurate all the time. Only rigor mortis (when the body stiffens) will be 100% proof of death. "​Death must be confirmed before disposal of any animal remains. A combination of criteria is most reliable in confirming death, including lack of pulse, breathing, corneal reflex and response to firm toe pinch, inability to hear respiratory sounds and heartbeat by use of a stethoscope, graying of the mucous membranes, and rigor mortis. None of these signs alone, except rigor mortis, confirms death. In small animals, particularly in animal shelter settings, verification of death may be supplemented by percutaneous cardiac puncture after the animal is unconscious. Failure of the needle and attached syringe to move after insertion into the heart (aspiration of blood provides evidence of correct location) indicates lack of cardiac muscle movement and death (AVMA) Read more..."
​Injectable agents (must be administered by personnel who are registered with the US DEA, and extralabel use requires administration by or under the supervision of a veterinarian. Strict record keeping is required of all who use and store these drugs). "Euthanasia methods for poultry (domesticated birds used for egg, meat, or feather production [eg, chickens, turkeys, quail, pheasants, ducks, geese]) include gas inhalation, manually applied blunt force trauma, cervical dislocation, decapitation, electrocution, gunshot, captive bolt, and injectable agents. Where appropriate, additional comments are included to address physiologic differences among avian species, variations in environment, and the size or age of birds" (AMVA).